Immunogen: Natural pig PYY (peptide with tyrosine; HYPAKPEAPGEDASPEELSRYYASLRHYLNLVTRQRY-NH2.). Specificity: Recognizes PYY in a wide range of species. Scientific Background: Peptide tyrosine tyrosine (PYY) is a 36 amino acid peptide, originally isolated from porcine gut, which exhibits striking sequence homology with members of the pancreatic polypeptide family, including neuropeptide tyrosine (NPY). The peptide is localised to enteroglucagon-containing (L/EG) and pancreatic (A) cells in many mammalian and nonmammalian species. PYY gene expression is upregulated by various growth factors, including growth hormone and insulin-like growth factor-1 and the physiological effects of PYY are mediated by G-protein (Gαi2) coupled Y-type receptors (‘Y2 receptors of a PYY-preferring subtype’). Various actions have been reported for PYY, including the inhibition of upper intestinal and exocrine pancreatic secretion, small intestinal water flux and as the mediator for the fat-induced ileal brake. The infusion of normal post-prandial concentrations of PYY[3-36] into human volunteers has been shown to significantly decrease appetite and reduce food intake, possibly via Y2R in the arcuate nucleus. This work stimulated a great deal of research activity showing that the truncated form of PYY reduced food intake in normal and obese humans and in rodents. Recently, the actions of PYY[3-36] and GLP-1[7-36] have been shown to inhibit food intake additively in humans and rats. Immunohistochemical studies on mice have shown that PYY is the earliest detectable peptide in both pancreatic islets and colonic endocrine cells, which suggest that PYY may be a useful marker for endocrine progenitor cells. Immunohistochemistry analysis: De-waxed section of Bouin-fixed fetal (14 day) rat pancreas stained with rabbit polyclonal antisera to PYY (Prod. No. BML-PA1254; panel a). 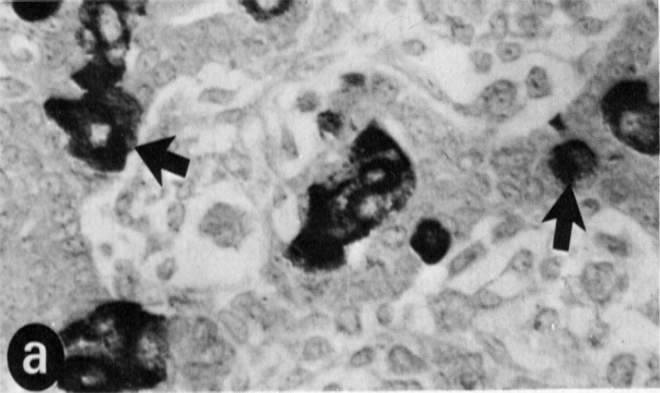 Arrows indicate identical cell profiles. From Ali-Rachedi et al., 1984. Immunohistochemistry analysis: De-waxed sections of Bouin-fixed fetal (14 day) rat pancreas stained with rabbit polyclonal antisera to glucagon (Prod. No. BML-GA1181; panel b). 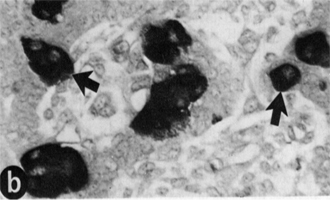 Arrows indicate identical cell profiles. From Ali-Rachedi et al., 1984.